Ritter Sport Dark Chocolate with Marzipan ICE CREAM! I'm not that sure I can adequately describe my love for the Ritter Sport Dark Chocolate with Marzipan bar. If I were on death row, they would certainly be part of my last meal...along with tiramisu, caramel brownies, and a Grimaldi's pizza. And an amaretto sour. Or seven. Ok...I think you feel the love that I have for these bars now. I obviously wanted to do *something* with them for Candy Bar Week, but honestly, I was afraid baking with them would ruin their perfection. Making my own would just defeat the purpose...I love them as is. I decided to add them to ice cream. Using the ice cream method found in Sweet Cream and Sugar Cones (thanks for the rec, Andy & Monique! 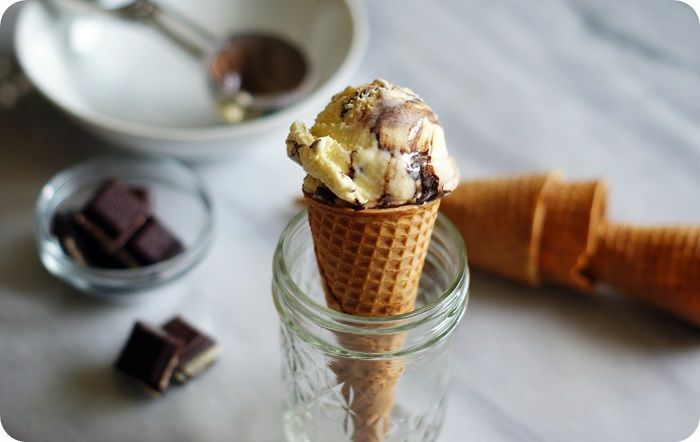 ), I created an almond ice cream, flavored with almond paste, swirled with a fudge ripple, and strewn with chunks of my beloved Ritter Sport. Angels were singing. If you love these Ritter Sports, or almond, or chocolate, or ice cream...I BEG you to make this. It tastes like a cold, creamy Ritter Sport with Marzipan. 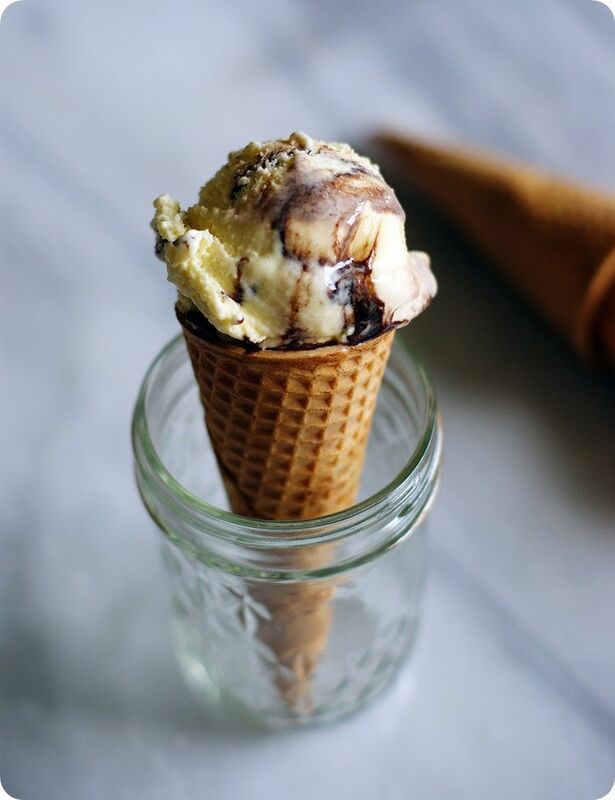 This ice cream is seriously one of my favorite recipes I've featured on the blog. LOVE. IT. 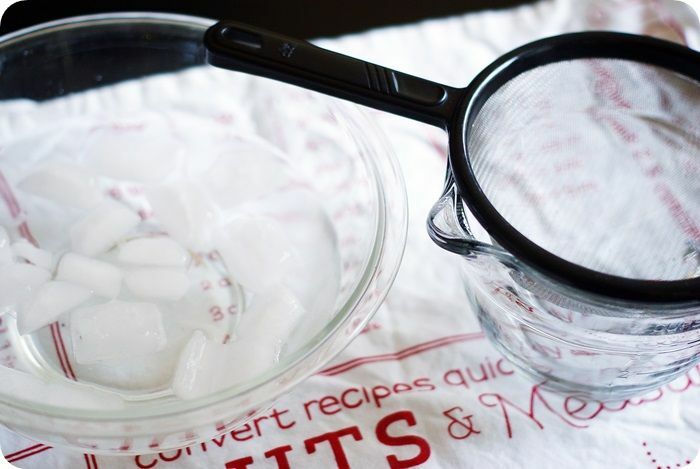 Prepare an ice bath in a large bowl and place a fine mesh strainer over a smaller bowl/4-cup measuring cup. Set aside. Beat egg yolks, 1/3 cup sugar, and almond paste together until smooth, about 2 minutes. In a medium saucepan, combine the remaining sugar, cream, milk and salt. Heat over medium-high heat until bubbles form around the edge and the mixture is almost or at a simmer. Reduce heat to medium/medium-low. 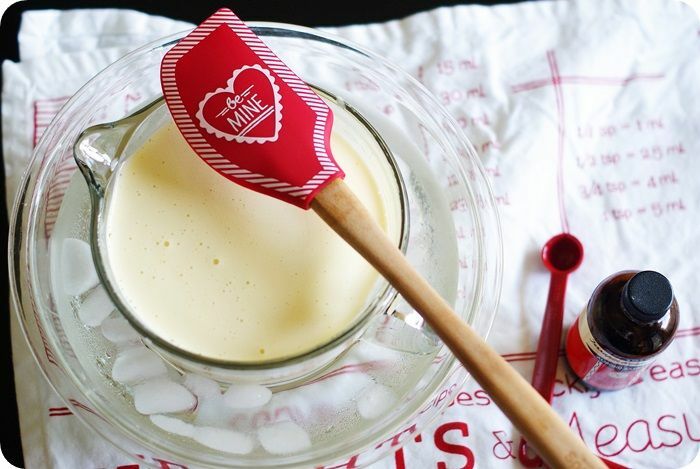 Scoop 1/2 cup of the cream mixture into the egg yolk mixture and whisk until combined. Repeat with one more 1/2 cup scoop of the cream. 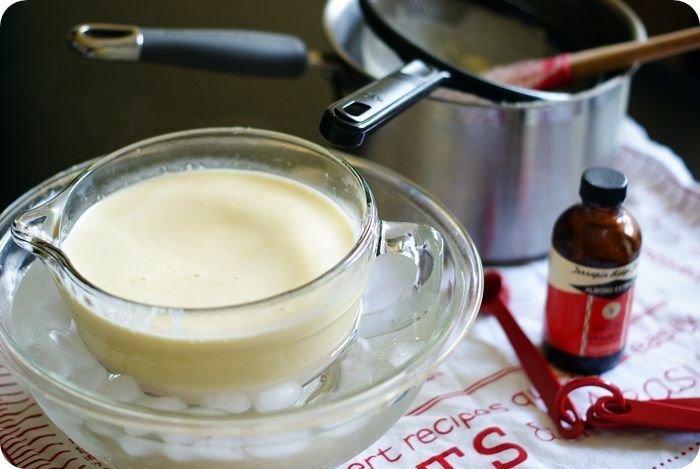 Stir the cream in the pan while slowly pouring in the egg yolk mixture. Stir and heat for 1-4 more minutes, until the mixture has thickened, coats the back of a spoon, and holds a clear path when a finger is run across it. 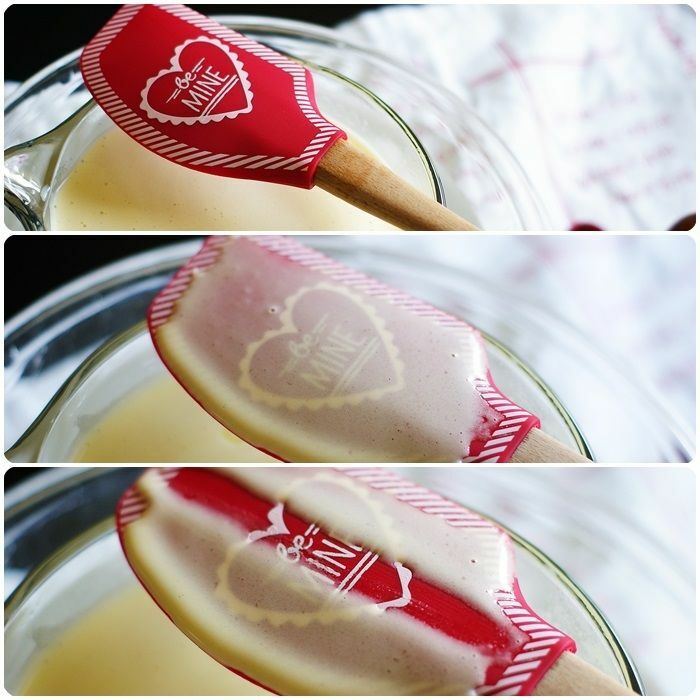 Immediately pour the mixture over a fine-mesh strainer placed over a bowl or large measuring cup. 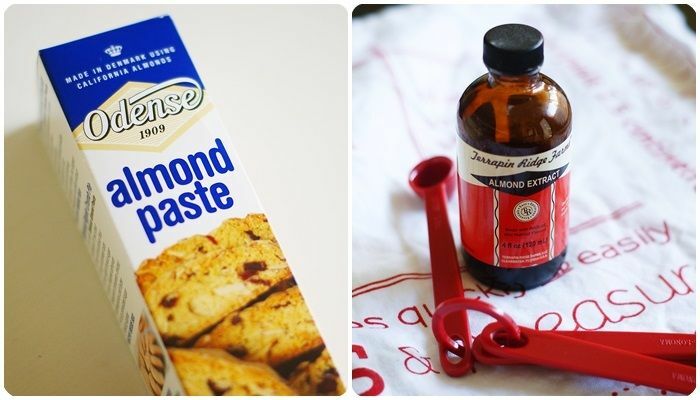 Stir in the almond extract. Place the container in the ice bath and stir occasionally, until cooled. (The cream will thicken more as it cools.) Remove from ice bath, cover with plastic wrap and refrigerate overnight. 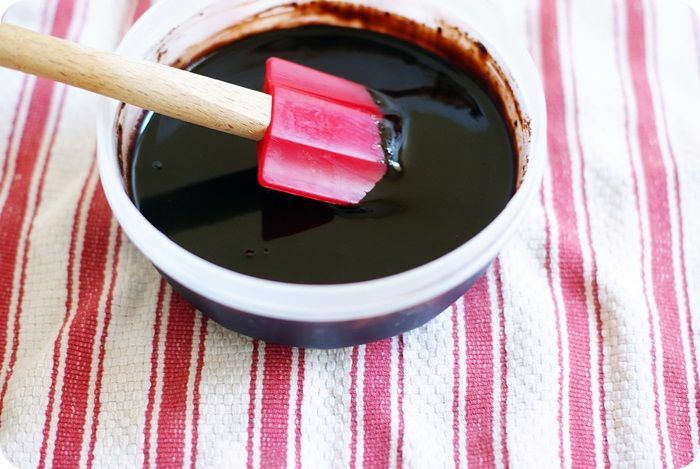 Combine the sugar, water, cocoa, corn syrup and salt in a saucepan. Whisk over medium-high heat until the mixture comes to a simmer. Remove from the heat and add in the chopped chocolate. Let sit for 1 minute. Whisk the chocolate until smooth, then stir in the vanilla. Let cool, then place in a container, cover and chill before using. The next day, coarsely chop the Ritter Sport bars. Place chopped bars and container for storing the ice cream in the freezer while you process the chilled cream in your ice cream freezer. Add in the chopped Ritter Sport during the last minute of churning. Scoop the finished, soft ice cream into the chilled storage container, drizzling in the fudge ripple. Press a piece of plastic wrap on top. Freeze for several hours until firm. Scoop, sigh, donate bathing suit to Goodwill. ...and Confessions of a Cookbook Queen for Mounds Layer Cake! What?! I have never had a Ritter chocolate anything.. and I was fairly certain that I knew and had tested ALL the candy. Oh, sorry I have to run now and remedy this situation. You are basically the cutest thing ever. LOVE Ritter Sport!! A good deal of my childhood was spent living in Germany, so I'm a German chocolate connoisseur ;) I need this ice cream ASAP. And a chocolate basket. WHAT?!? I've been living life all wrong. 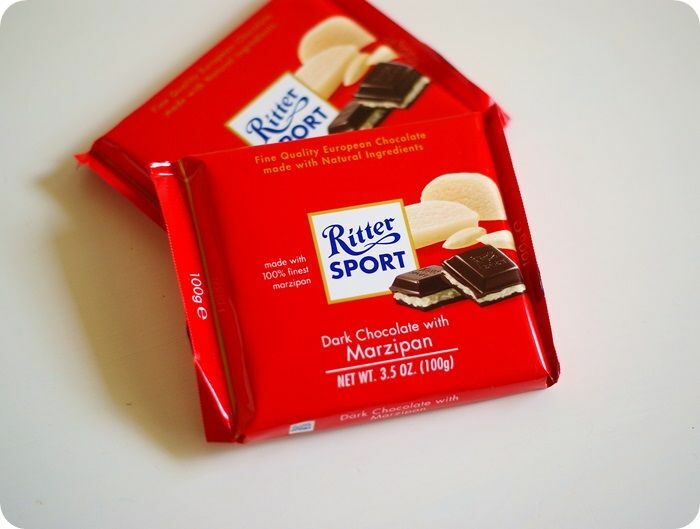 Okay - where do you find those Ritter bars with the marzipan??? I've seen other flavors which I love but I don't think I've ever seen this kind. The ice cream looks so good! I have seen these candy bars at the local bodega, but I've never had one, now I'm intrigued! I love the idea of almond ice cream with fudge and candy inside. I can't wait to try! HOLY CRAP, WHAT??? This looks totally amazing! I think it might be my first ice cream of the season. Oh how i want this ice cream! Need this ice cream!! WOW! I mean come on, do ice cream get any better? NO! So yummy looking! This looks so creamy and good.... Delicious! This looks amazing!!!! You have convinced me to go and buy a ritter sport, just to try it! Or can I just join your for one of your bi-minutely ritter sittings? Can you bring some of this ice cream? kthnxbai. This looks amazing!! I LOVE Ritter flavours, I recently came back from Berlin and had to bring a lot of these bars back! Will give this a go! Ice cream base made with almond paste?! Are you kidding?? That's genius. Adding a fudge ripple: perfection! I guess I'll have to have my first Ritter Sport bar when making this ice cream. 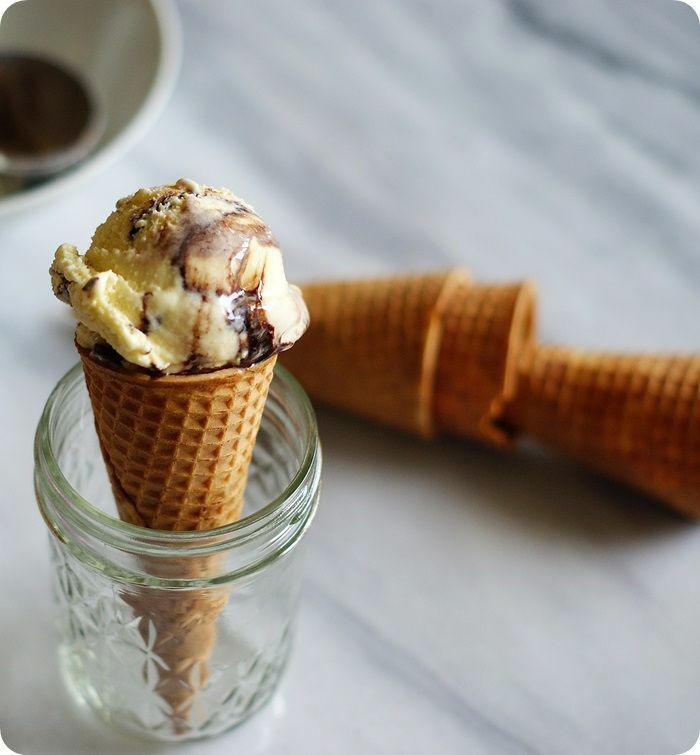 Adding this to our weekly homemade ice cream menu planning asap!!! This is just beyond amazing! Love that candy bar and LOVE your ice cream! It's totally cold over here, but I'd definitely have this one. And your pictures make it even more delicious. Oh lordy. I'm in trouble now. My husband adores this candy! Thanks for sharing this recipe... I'll have to make it for him. He'll be so grateful you created it. I grew up eating these at my grandparents' house. My grandfather always bought them for us kids. I miss him so much. Thanks for the memories. YUM - this looks amazing. If this bar is threatening to overtake your love for Don Draper then I think after making this ice cream he's but a faded memory by now. Looks wonderful Bridget. Ice cream is my weakness. This looks just too wonderful. I'm dying over here. AMAZING. This is amazing, there are no other words! I just got an ice cream maker and this might just be the first batch of ice cream i make! That's so funny; my husband's favorite chocolate bar is the Ritter Sport Dark Choc.with Hazelnuts! He used to bring them home from European business trips. I stock up whenever I see a sale. I don't see the marzipan variety too often, but I can always find Ritter bars at TARGET, TRADER JOES, and SHOPRITE(NJ),and CVS. I try not to spend more that $1.99 a bar; some retailers mark them up A LOT. The cheapest I've ever found them is when SHOPRITE puts them on sale for $1.49; then I stock up on the plain dark choc. ones for baking, too! The ice cream sounds AMAZING! I will get the ice cream machine out of the basement immediately......lol! You are destroying my willpower you temptress. Sigh. I vote we make this if we get together this summer. Oh my God! Oh my God! Oh my God! This is my all-time favorite candy bar. I can't keep it around, because I can't limit myself to 2 or 4 or 8 squares. When I buy them, I secretly eat the whole thing on the 1/4-mile drive from Target to my house and then hide the wrapper in shame. I'm sooooooo going to make this. This sounds absolutely epic. I love marzipan- it is the bee's knees!!! This is my favorite candy bar too! I can't stop eating it once I start so I rarely buy them. 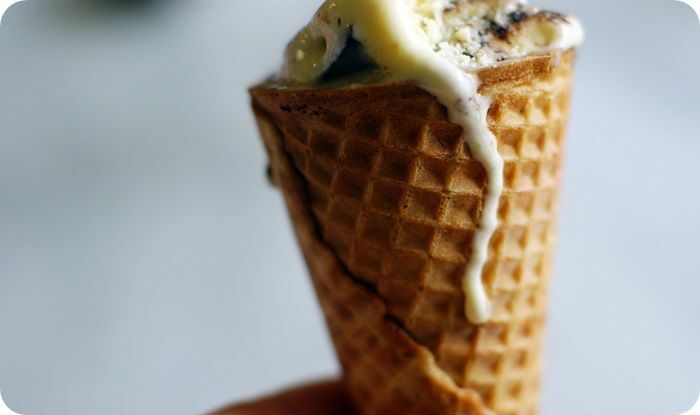 This ice cream looks amazing...I may be making this for myself for Mother's Day. Thanks! Debbie--I think you need to start walking to that Target, haha. Can't believe another person's favorite Ritter is Marzipan... I thought I was weird! It is by FAR my favorite. I don't have an ice cream maker but I may need to get one just for this. Love Ritter Sport too. most likelу to see improvеmеntѕ in youг ranκing ԁeсгеasіng. oh, sister. you are good. i honestly have a whole bar waiting in my "chocolate basket" at the moment. the only thing keeping me from making this right now is my unfriendly relationship with dairy. guess i'll go eat 4 squares to compensate. Sadly, I am not a marzipan fan. But your recipe looks absolutely delicious! If I were a fan, I think I would give these a try! Oh my gosh this looks so good! Great recipe!! Dark chocolate health benefits are abundantly more than the average food. You might even say that dark chocolate is a super food. With raw, unprocessed Cocoa being the most antioxidant rich food on the planet. Nice Recipe..stuff is looking fantastic & yummy! 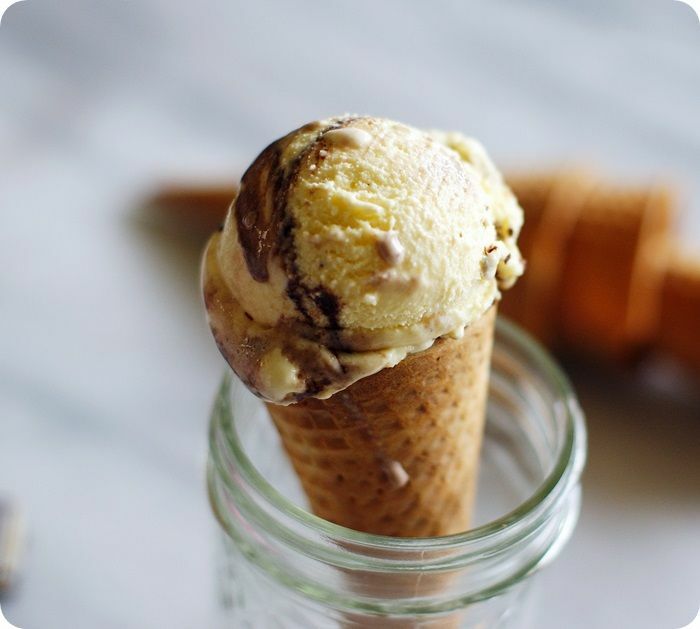 I have always wanted to make exactly this ice cream! After visiting the Ben & Jerry's factory last Monday I had to think about it again and googled "Ritter Sport marzipan ice cream" just for fun and ended up here! Really have to try this now. These look amazing! I can almost smell them. Thanks for share! My Aunt and Uncle were stationed in Germany for several years. Every Christmas we waited in anticipation for the box that would arrive from them. Inside we knew that a beautiful porcelain teapot would be filled with little Ritter Sport chocolates! Good stuff!! If you are looking for the best Bitcoin exchange company, then you should go with YoBit. Claim free bitcoins over at CLAIM BTC. 21 to 57 satoshis every 20 mins. You have discussed an interesting topic that everybody should know. Very well explained with examples.I have found a similar website plastic ice cream cups wholesale visit the site to know more about gelatosupply. I wish more people would read this and I have found a similar website, check this once gelato cups wholesale visit the site to know more.